Separation standards refer to the minimum distance apart that aircraft operating in controlled airspace and at airports with an operational control tower must be kept. These are outlined in the Manual of Standards for Air Traffic Services and our air traffic controllers use them to safely manage air traffic. Different separation standards apply to aircraft operating under instrument flight rules (IFR – all large passenger aircraft) or visual flight rules (VFR – most light aircraft and helicopters). Air traffic controllers must keep aircraft separated vertically or horizontally. In Australia, aircraft flying under instrument flight rules (IFR) in controlled airspace up to 29 000 ft (8800 m) must be separated by 1000 ft (305 m) vertically unless they are separated horizontally. Above 29 000 ft, the vertical separation increases to 2000 ft (610 m), except in airspace where Reduced Vertical Separation Minima (RVSM) is applied. When aircraft are separated vertically, horizontal separation can be reduced without compromising safety. In controlled en route airspace, the horizontal separation standard between aircraft flying at the same altitude is 5 nm (9260 m). In terminal area airspace, the minimum separation is 3 nm (5500 m). Within the confines of an airport control zone, the separation can be as close as practicable as long as the aircraft remain separated. In airspace not monitored by radar or other satellite-based navigation services, aircraft separation is achieved by the use of various procedural rules including time and estimated position. In the air, visual flying separation depends on where aircraft are flying. For example, over Sydney Harbour sightseeing helicopters use ‘see and avoid’ principals whereas pilots maintain their own separation. For general aviation aircraft (non-commercial aircraft) outside of controlled airspace, separation can be as close as 500 ft (152 m) vertically and 500 ft horizontally. A loss of separation assurance (LOSA) occurs when there has not been a clear application of a separation standard. This can happen for a range of reasons, and does not mean there has been any infringement of separation standards. 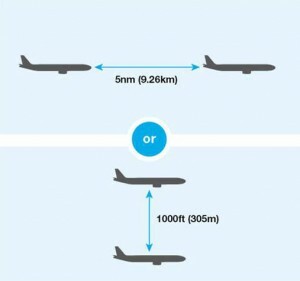 When two aircraft experience an infringement of the minimum separation distance (which varies depending on the airspace classification), it is referred to as a loss of separation (LOS). A LOS does not mean that the aircraft were at any risk of colliding, or that the incident was a ‘near miss’, it simply means that separation standards were not maintained.